Natalie used to spend around $1500 a year on gas but now uses the grounded socket in her garage to charge her EV. When asked if she had noticed a change in her electricity bill now that she is charging at home, she responds by saying, “I haven’t noticed a marked increase in my electricity bill.” Like other EV drivers, it costs Natalie less to charge her electric vehicle than what she would spend filling up a gas powered car. “My initial perception of EVs was that they were golf carts or ‘clown cars,’ but I’ve come to realize EVs are a lot like internal combustion engine vehicles. As far as the energy fuel source, I do think EVs are the future of transportation,” says EV owner, Harry. Technology is advancing every day, creating ways to help us live more efficiently. “Driving electric has freed up additional time, as I no longer stop at convenience stores or gas stations or schedule the periodic oil change.” By choosing to drive electric, Harry can spend less of his time on car maintenance and spend more time doing the things he loves, like running and landscaping. Mike says, “The best thing is, by charging at home, I don’t have to worry about credit card skimming. My wife and I feel safer because we no longer have to stand at a pump for five minutes.” When it comes to charging your EV, you can do it in the comfort of your home. Just plug it in and go about your day. It’s as easy as charging your cell phone. The biggest hassle for most car owners is the time-consuming maintenance checks. As Mike describes it, “My wife is busy. If she has to sit at a dealership to wait for oil changes and other maintenance, she’s wasting time. In the three years I’ve been driving an EV I have only had to change a tire once, due to an Oklahoma pothole, and I’ve put in washer fluid.” Driving an EV helps save you money, time, and gives you a sense of security. More than a money-saving alternative or an environmentally responsible decision, it’s a logical choice. With sticker prices dropping and ranges exceeding 200 miles (on average, Americans drive less than 30 miles each day), more families are clearing garage space for an electric vehicle (EV), with many making it their second car. How easy is home charging? OGE | Electric Vehicle from Scissortail Media on Vimeo. OG&E’s rates are below the national average. So, our customers—and new EV owners in our area—find it less expensive to use electricity all day anyway. But that's only one of the huge benefits of driving electric. Federal incentives can take as much as $7,500 off the sticker price of any EV. When compared to buying gasoline, fueling up with electricity is a whole lot cheaper. Switch to SmartHours: Charge up with nearly half-price electricity. In addition to federal and state incentives, most every auto insurance company is now offering discounts for drivers of hybrid or electric cars. Why not check with your insurance company? Many plug-in buyers are choosing to lease rather than buy an EV. And with a growing pre-owned market, make sure to check with local dealerships. Today, there are more options than ever when you go electric. Whether you’re driving to work, or out of town, how much are you spending on gas … when you could use electricity? The eGallon calculator from the Department of Energy provides the answer—showing you how much it costs to drive the same distance on electricity or a gallon of gasoline. You’ll find fueling with gas can cost more than three times the price of electricity (since gas prices fluctuate based on international demand). Give it a try. OG&E helps EV drivers charge cheaper. In winter months, November through April, you pay less than half of the standard rate for any usage over 600 kWh (which is more than the average household will use). Money-saving programs help too. 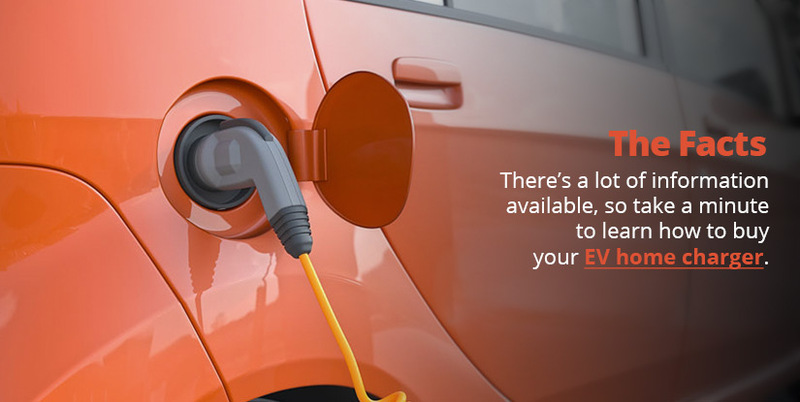 During summer, switch to SmartHours and charge your EV with nearly half-price, off-peak electricity on weekdays and all weekend—at only 5¢ per kWh. With some EVs being able to travel five miles on one kWh, you could spend as little as 1¢ per mile to power your EV! It’s a fact: Every month, OG&E has rates well below the national average (and much lower than gas pump prices). No more oil changes. Or spark plugs. Or fan belts. So, there’s much less maintenance. You’ve heard about the efficiency and low cost, but check out the electric feeling of new high-tech EVs. From the state-of-the-art amenities, to the head-rush of immediate torque and the prestige of ‘going green,’ EVs are an exciting investment. No oil or spark plug changes. Same for fan belts, or any other replacement parts for a car that runs on gas. What’s more, the brakes on an electric car also have a longer life because EVs slow down by reversing the electric motor rather than by mechanical friction. This means an EV is not only a ‘green choice,’ but an economic choice. While there are many different makes and models of electric cars, you can sense the instant torque and acceleration on most any—zero to 60 is quick and quiet. Literally, because electric motors make no noise and provide the quietest ride available. Also, with the battery weight so low in the vehicle, and since all their torque is available from a standstill, EVs can be remarkably agile—like a sports car. It could be the biggest myth. You might think electric vehicles are sluggish and a dull experience. You’d be wrong. We’ve talked about the exciting ride, but the ‘cool factor’ of driving an EV is off the charts. All the techy amenities are there, from rear-view cameras to connectivity. And thanks to the ‘Tesla glow,’ many who switch to the eco-friendly status of driving an EV will never look back. Oh, and they’re literally cool too, since EVs emit significantly less heat than gas-powered vehicles. Since they have no tailpipe, and produce no byproducts of combustion, all EVs are zero-emission vehicles. OG&E is a pioneer in wind energy. So EV drivers can sign up, and double up on their commitment to a clean future. Together, we’ve made our state a renewable energy leader. And we’re now generating power from the sun. All-electric cars have no tailpipe. Not a one. And because they have no heat or byproducts of gasoline combustion, EVs are zero-emission vehicles. The DOE reports that a car running on gas emits 75 lbs. of CO2 during a 100-mile trip. Compare that to 32 lbs. of CO2 emitted from a power plant to generate enough electricity to power an EV for the same 100 miles. And when you rely on OG&E’s renewable power, like solar or wind, the emissions are even less for EVs. Can you believe it costs just pennies a day to ensure a better future? The OKC Thunder believe it. So do more homeowners and businesses. More and more customers are choosing abundant, renewable OG&E Wind Power. And signing up is a breeze. Simply choose your wind power commitment, then for a few more pennies each day you’ll cut your carbon footprint and move our country a little closer to energy independence. Join the wind revolution. While the OG&E Solar Power program is currently sold out, you can join the waiting list and stake your claim—like EV drivers—as a renewable energy pioneer. Solar benefits are easy to understand. As electricity production costs increase over time, OG&E’s Solar Power comes with a life-long price—guaranteed to never be higher than it is now while the solar farm is producing. And during summer months, you’ll receive great discounts during off-peak hours. Learn more about this bright idea. 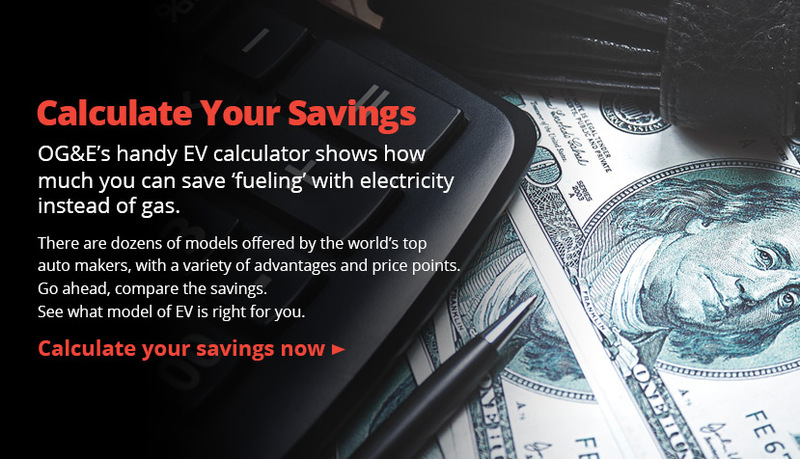 After adding up your savings and choosing your model, why not take an EV for a spin? It a great experience. And we’ve got these handy suggestions to make your test drive even more rewarding. Try these tips. Charge up at home overnight using a standard wall outlet. Or install a level 2 plug in your garage—like you use for a dryer—for faster charging. Or simply stop by a charging station, they’re popping up all over. There are multiple options when powering your new electric vehicle. Level 1 - Typically a portable charger, it provides up to 5 miles in range for each hour charging. Level 2 - Typically a hardwired charger installed at your residence, workplace or public parking, which provides up to 20 miles in range for each hour charging. Level 3 (DC Fast Charge) - Located exclusively at public parking areas, these can provide up to 70 miles in range per 20 minutes of charging. Questions about charging electric cars? We hook you up with answers. There’s a growing infrastructure of public quick-charging stations nationwide. And PlugShare helps find the right one for you. Don’t forget to talk to your electrician or local companies and contractors. They can offer more tips about what’s best for a personal home charging station.